Can Federer finally flourish at the French Open? World tennis number two Roger Federer has given his fans some hope that this year could be the year he finally conquers all at Roland Garros. The 27-year-old from Switzerland has won 13 Grand Slam titles, but never the clay court-contested French Open. Federer’s nemesis, Rafael Nadal, has already claimed the Australian Open in a strong start to 2009, and his preparations towards a fifth consecutive French Open title seemed to be all in order until the Swiss player struck at the Madrid Open this week. Federer downed the world number one and French Open favorite 6-4, 6-4 in the tournament final to record just his second win over the Spaniard on clay courts in 11 matches. Despite the result, Nadal still heads to Roland Garros as the tournament favorite. But, what chance does it give Switzerland’s top man who has won every Slam except the French Open According to the experts, Federer’s hopes are fairly slim. Six-time Grand Slam winner Boris Becker told CNN that Federer has little chance of keeping up with Nadal once again. In an exclusive interview, Becker said he fancied Nadal would dominate the tournament in Paris once more. “What a record this guy has. He’s never lost a match at the French Open and at the moment I don’t see anyone stopping him.” Becker, who like Federer has won multiple Grand Slam titles but no French Open, said Nadal’s power was the major challenge for his opponents. “He has the most powerful ground strokes … everybody has seen his triceps. And the acceleration he has with the racquet is second to none. “He creates so much top spin off the ball that once a rally starts, [his opponents] are already on the back foot,” Becker said. However, the ATP Web site reported Federer as saying he was confident he has the ability to win the French Open after his triumph in Madrid. 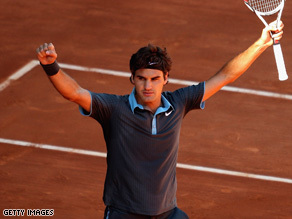 Debate: Do you think Federer can win the French Open this year Tell us in the Sound Off box below. “It’s not the moment to get carried away but it is definitely good for my confidence, especially beating Rafa in the final, so it definitely proves that I am doing the right things and I am working extremely hard and it is paying off, so its a nice feeling. “I am very excited about going to Paris, whereas a couple of weeks ago I was still a little bit unsure about my game and not sure if I could win the French Open.” Widely-published British tennis writer Simon Cambers has no doubts that Federer’s confidence will have been boosted by Madrid but, he told CNN, he feels that Serbian player Novak Djokovic offers a greater threat to Nadal’s supremacy in Paris. “The whole thing really depends on the draw … but I would make Djokovic the biggest threat to Nadal,” Cambers said. Djokovic is ranked at number four in the world and has made the semi-final of the French Open for the last two years. Cambers felt the Madrid result would not affect Nadal’s confidence from an otherwise good start to the year, while Federer was still struggling to show consistent form — despite the win. “It’s the first time in a long time that he has beaten one of the top four. But I think it’s slightly misleading. I certainly wouldn’t read much into it from Nadal’s point of view,” he said. Before the win in Madrid, Federer had not registered a victory since an indoor tournament in the Swiss city of Basel in October last year. He has twice lost to Scottish player Andy Murray and Novak Djokovic in ATP tournaments this year. Coming into this year’s tournament, Federer has lost the French Open final to Nadal for the last three years running.